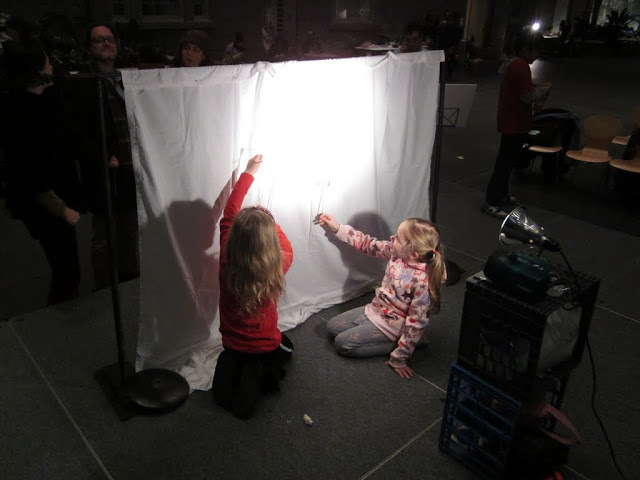 While the performance part of the Smithsonian Shadow Family Night was fun and successful, we had just as much fun working with the many children and their families who came to our table to make shadow puppets and try them out on a simple screen. 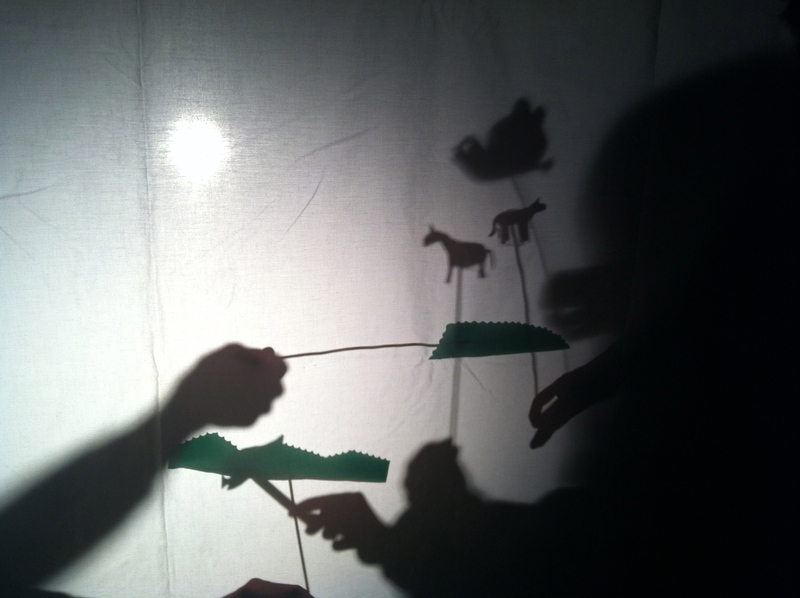 Shadow puppets are one of the simplest kinds of puppets to make–all you need is some thick paper, scissors, tape and something to be a control rod. We had very small children whose parents cut out their fish or bear puppet and older kids who insisted on doing everything themselves. The screen and lights were enough to keep some participants busy the entire time, as the picture below shows, you really only need your hands and a light to have a good time with a shadow screen! Most kids stuck with the stencils that we provided, and made their own adjustments using scissors to make (among other creatures) a fish with circular scales, a bear with jagged hair or a ‘dolphin-butterfly.’ However, we had two older girls who decided to leap past all of those and instead create unicorns, grass, a huge butterfly and a rainbow, to tell their own stories. We were blown away by their creativity and meticulous attention to detail and remembered once again how perfect puppetry is for letting people accomplish as much as they like through imagination. The lovely unicorns and green fields designed by workshop participants. What DOES a shadow of a rainbow look like? 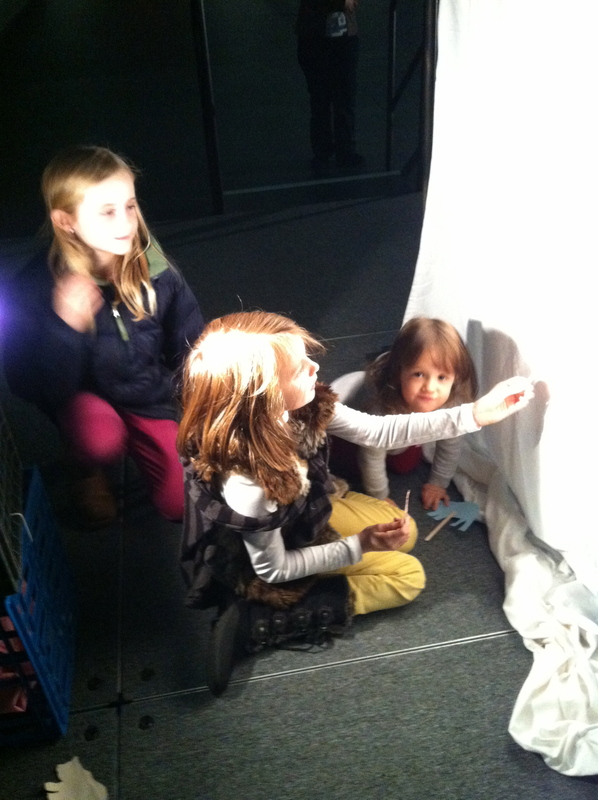 The girls who designed the puppets above, with a young admirer. 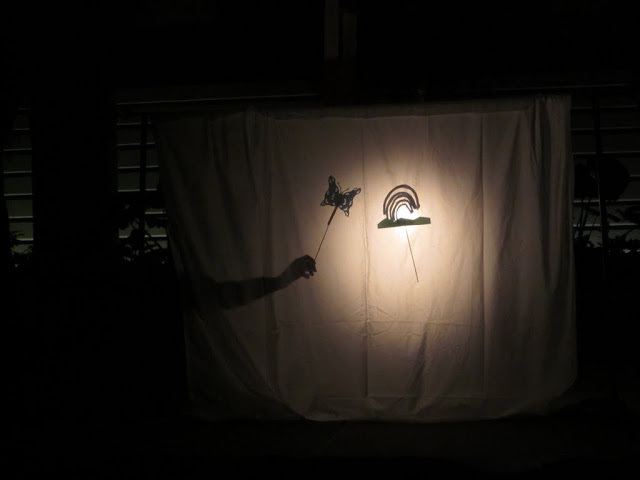 This entry was posted in Events, Workshops and tagged American Art Museum, creativity, puppets by children, rainbow puppet, Shadow Family Night, shadow puppet workshop, Smithsonian, unicorn puppet by ccbooks. Bookmark the permalink.